Saturday, 31 July-0105: We arrived at the port city of Dudinka. The sky at this ungodly hour was still blue. There was no darkness yet, at this location north of the Arctic Circle. 0530: We were awakened from our sleep. We were told last night that we would not have breakfast on the ship this morning. Instead, we would eat after we arrived at Norilsk. 0650: We took a bus from the ship to the train station. We rode on the world's northernmost railroad. 0712: The train left Dudinka. 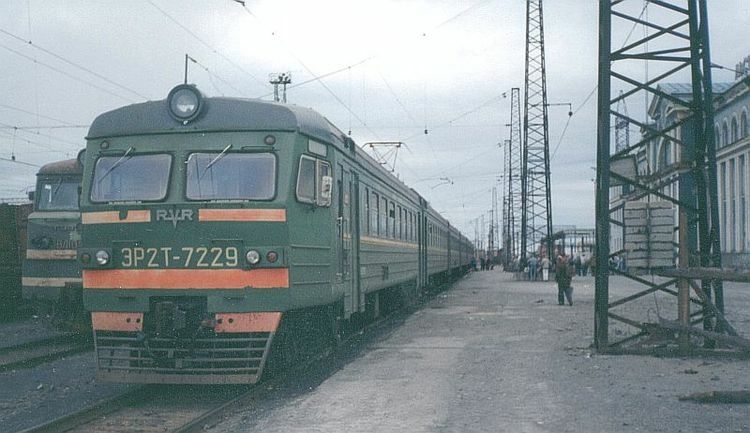 An electric engine pulled this train between Dudinka and Norilsk. Note how wide these cars are, Enough for 6 across seating, with an aisle. 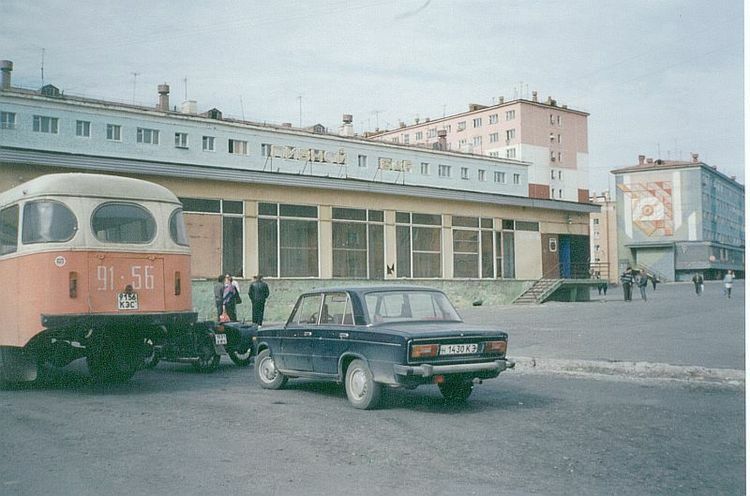 There was a diesel engine line that ran from Norilsk north a short distance to Tainax, a suburb of Norilsk. 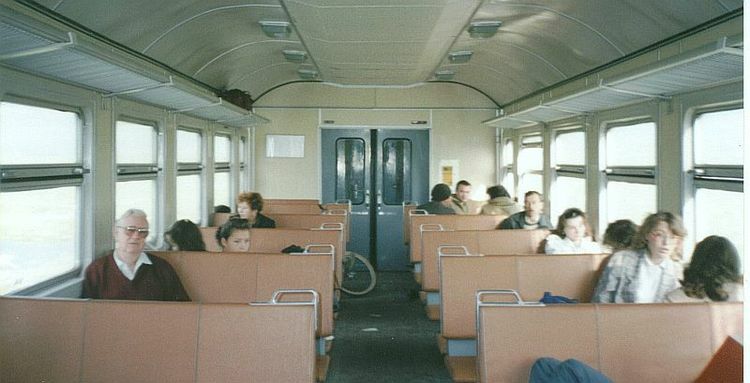 The passenger cars were just like the ones that we rode in Latvia and Lithuania. They were very wide. Four persons could sit on bench seats that were on each side of a center aisle. The coach could easily seat over 100 persons. We passed the Dudinka harbor which stretched about 4 kilometers on both sides along a tributary river that flows into the Yenisey. We went through a huge railroad shunting and storage area for boxcars of all types. I was a surprised to see such a large city and harbor perhaps even larger than the port of Long Beach, California, away up here in the middle of nowhere. 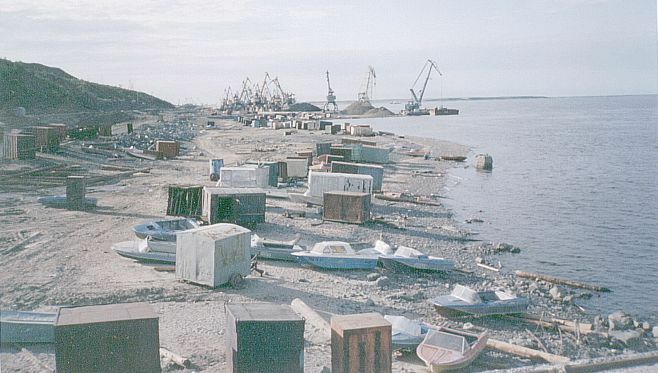 Igarka to the south was a large port, but mainly for Russian oceangoing vessels. Here in Dudinka, there were oceangoing ships from many nations, even of non Communist countries. The railroad track was the same gage as the rest of Russia, and built high on rock footings. At many points along the way, there were snow fences to keep the winter snows from drifting onto the tracks. At several siding locations, there were huge diesel and electric locomotives fitted with snowplows and snow throwing devices. Most of the rail line was of single track. At each of the stopping points, sometimes just a road crossing, there were double or triple rows of track for passing or siding purposes. The terrain was barren, tundra and dotted with many military installations. The airport for the area was military, but Aeroflot had daily flights from the south. Typical of most airfields we had seen along the river, were the three sectioned phased-array type radar antennae. The train stopped at the small town of Coercion, where the mosquitos and flies became a big nuisance. We stopped there for about 30 minutes, while a train on the single track ahead cleared it. Our train passed huge diggings where coal was extracted by huge tracked scraping machines. Much of this coal was moved in pipes laid over the ground to the furnaces at the steel and copper mills near Norilsk. 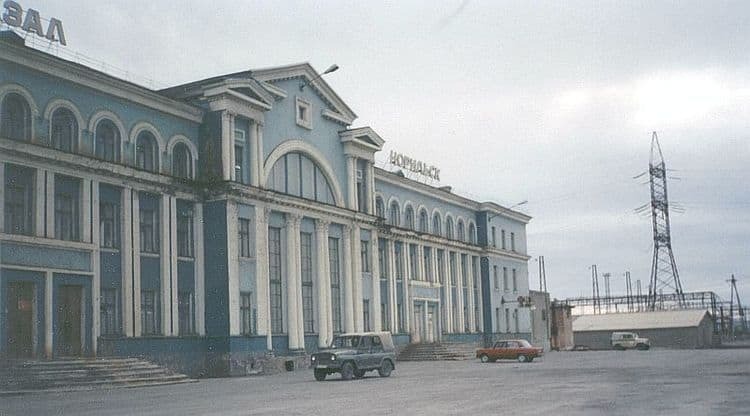 1015: We arrived at the Norilsk train station. The station was a large building much as you might find in any medium sized city in Europe. Another surprise was the extent of the train marshaling yards here, the factory areas surrounding the housing units of the city, and the buildings within the city. All these years I thought Siberia was a wasteland, loaded with Soviet prison communities and the like. 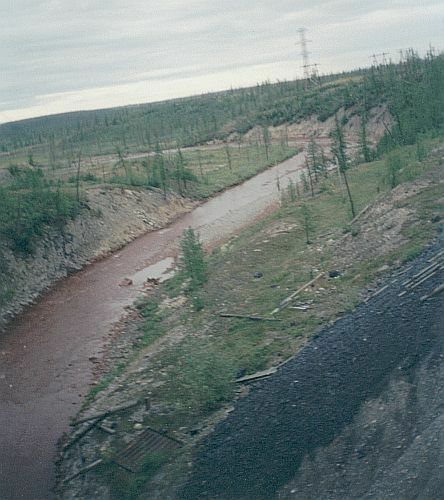 Here, way out in the middle of nowhere, Norilsk was connected to the world by a railroad line to the river Yenisey at Dudinka. There were no roads. This was a city of 1.5 million people. It had large apartment buildings made of concrete. All of its streets were wider than normal, and were covered with asphalt. All the streets had wide sidewalks for pedestrians. The main street had flower dividers down the middle, and was closed to vehicular traffic on Saturdays and Sundays. There were trams (streetcars) on their own rights-of-way, and many bus lines including the accordion type buses. The main street was over 2 kilometers long and each building along the way was about 6 floors high. Stores of all types were on the ground floor. Remember, because of the permafrost the ground floors of these building were all about 3 or 4 feet above the ground. 1100: We had breakfast in a large government first class restaurant right on the main street across from the main theater. 1130: We returned to the buses to begin our city tour. We were driven around the city and shown the type of housing available. At one stop, we got a chance to look at the smoke belching from the steel mills. These were located outside the city at the foot of a mountain. The guide pointed to a small building on the side of the hill. She explained that Stalin had a slave camp there. The workers from this camp were lead into the mines within the mountain . They worked long hours, with little food, and often died in just a short while after arrival. 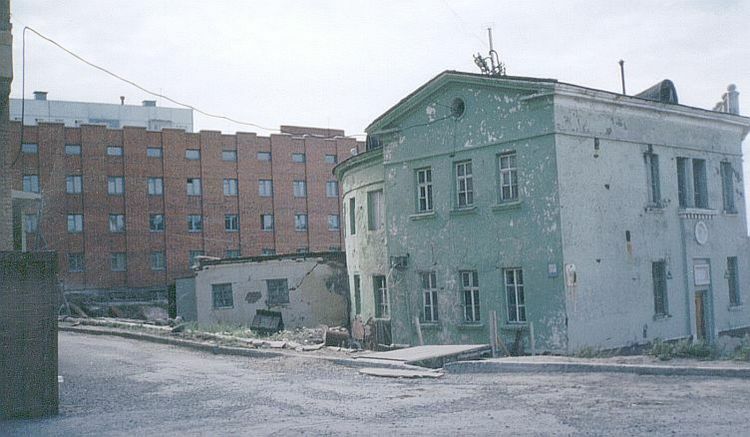 After Stalin died, the camp was abolished and the city began to expand. Workers were brought from all over Russia with promises of better wages and free vacations to the Black Sea. It worked judging by the 1.5 million people now here. 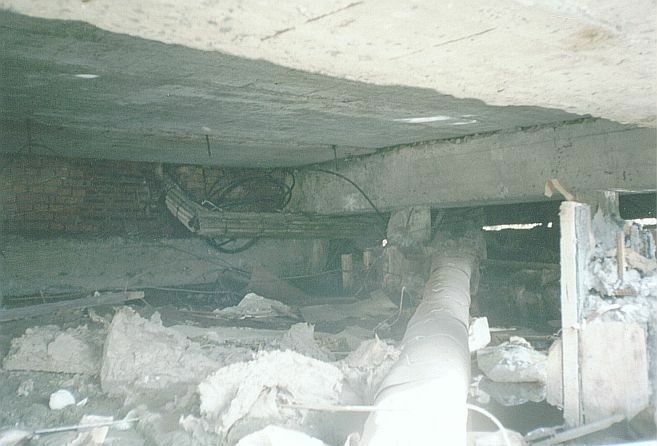 She also noted that just before the collapse of the USSR, plans were underway to replace the smoke belching equipment with better controls for the environment. In the colder weather, water was pumped in and around the furnaces and then piped into the housing units for heat. After driving around the city, the bus dropped us at a museum showing scenes and artifacts of the animals, the forest, the tundra. There was also a large area devoted to the gulags of Stalin. They had pieces of fencing, gates with bars, furniture and bed items, and miscellaneous personal items of prisoners. After visiting the museum, we were taken to an art gallery. They had more to sell than to show. Back on the bus, we went outside the city into the tundra, north into a large mosquito infested area where we saw one of their summer resort camps. The one we walked around was not much different from a small campsite found in the mountain towns of the US. Only difference, there were a central kitchen and eating area. There was no running water in the cabins. The toilets were outside, with no plumbing. The inside of the cabins looked comfortable with separate rooms for the kids and adults. 1530: The bus returned us to the restaurant where we had lunch. It was typical of that aboard the ship. 1600-1800: After lunch we were free to walk around the city as we pleased. There had been a noticeable lack of militant authoritarian police activity. Crime was nonexistent. The problems of Moscow were not here. You know the stories. 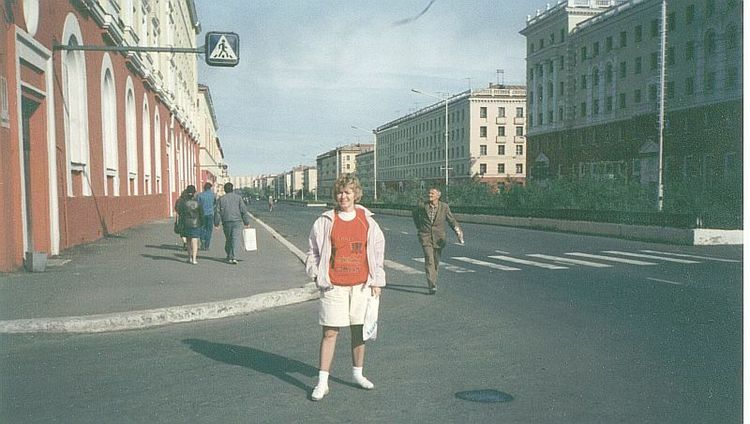 KGB and other police lurked from dark cars or followed you as you walked about. Hoodlums or "Mafia" stalked and robbed visitors. Never during this trip did we ever feel threatened either by the police or possible criminals. We had always tried and were successful in blending into the community and life of the locations we visited. So, too, here we looked just like anyone else walking the streets. We stopped in many stores along the two kilometer walk to the other end of the main street. We saw an Opteka (Optics) shop, went in, and showed the clerk Danuta's eyeglass prescription. Bad news, it would take two weeks to get a pair of glasses back. So, instead we bought two sets of lenses for her prescription and two different frames. The frames were 518 Rubles and the lenses were 90 Rubles. That came to 30 cents for each pair of glasses. In the US we would pay upwards of $90 for one equivalent set. We also bought beer and soft drinks for 2050 Rubles. 1800-1830: The buses arrived to take us to the train station. They were not the same tour buses as before. This time they had normal buses that were too small for the whole group, so some had to stand. The trip was short. We passed the housing area, and many factories that worked with steel and copper products. As usual, we arrived in plenty of time to wait and wait. 1926-2246: Per the timetable, our train left right on the dot. We again stopped for half an hour at the town of Coercion. Before the train left, we swatted about fifty or so mosquitos that landed on the window and wall of our car. It wasn't until we had been gone about 45 minutes that we killed the last one. We returned to Dudinka over the same route, single track of course. 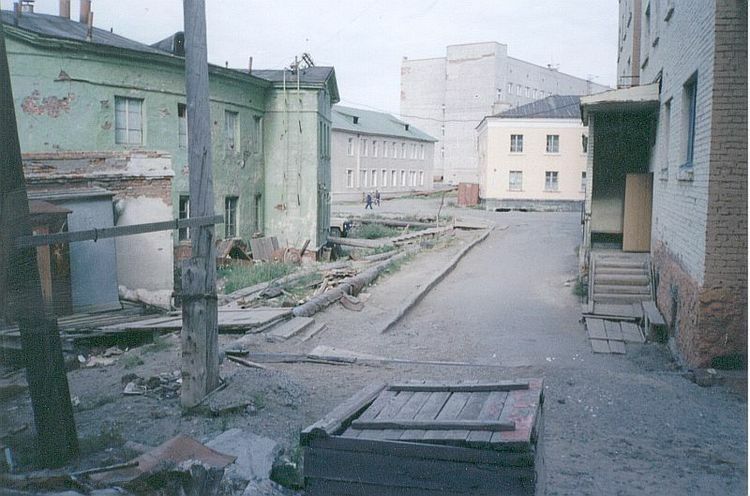 We saw the same locations as on our trip to Norilsk. But, now many locations where people were living, supposedly in the middle of nowhere, made more sense after visiting the museum in Norilsk. A young girl sitting in the seat behind me heard Danuta and me talking in English. Finally she got up enough nerve to ask me if I were English. I told her no, that I was an American. Oh, was she ever excited. She tried to talk to me in English. She was in her third year of English in school. I asked her about how many Americans she had seen. I was the first. 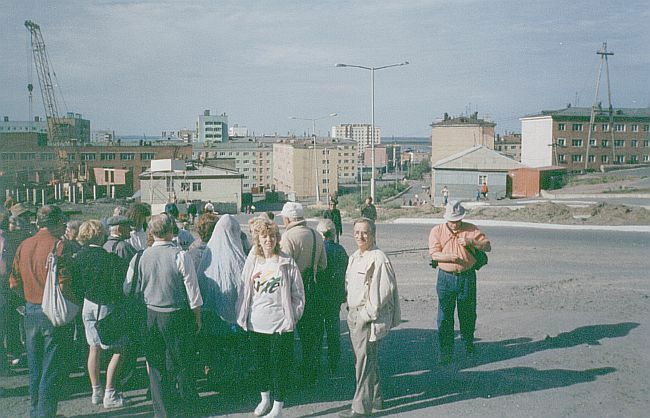 She said that only Russians and east block persons ever came to Norilsk. She said that she goes to Dudinka to stay with her grandmother for a week or two in the summer. There she sees many foreigners who come with the ships to the port. 2300: Finally, we got back on board ship . Fully exhausted, we dropped off to sleep. Sunday, 1 August-0930: After our normal wake up call and breakfast, we awaited the arrival of the buses that would take us on a brief tour of Dudinka. Because of the high water flowing during the spring, the dirt road from our floating dock to the first paved road was about 3 kilometers. Our bus was not well sealed and the dust poured in to the point that it was difficult to breathe. Finally we hit the pavement and the dust blew out. The bus drove us up to the top of a hill on which was located a large apartment building. It contained a very nice ethnic museum. It showed the history of this region in dioramas, photos, and of course artifacts of the gulags. The souvenir stand sold us a sheet of lapel pins for $2. This was only the second time, Igarka was the first, that we could use US$ to purchase something. Everyplace else would only take the new 1993 dated Rubles. 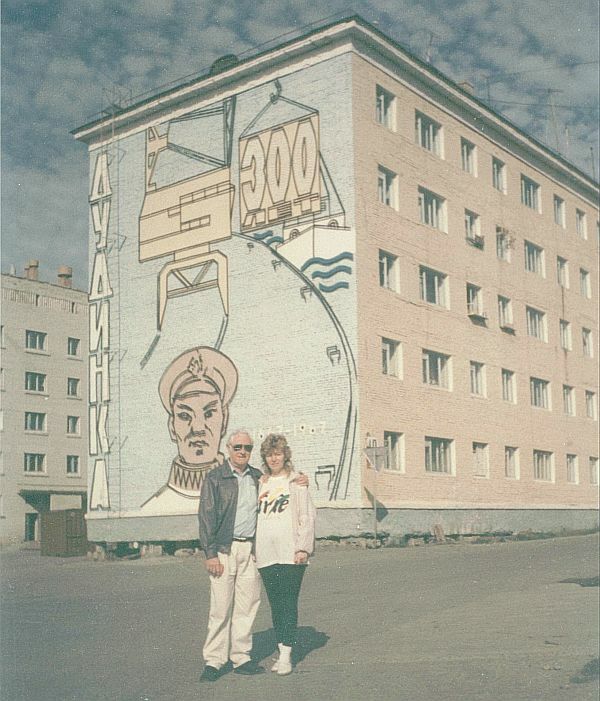 Lester & Danuta in front of the building shown in other photo above. The one kilometer walk back to the bus pickup point was all downhill. This was Sunday and all the stores except those selling snacks and foods were closed. We stopped by a small flea market and looked at the goods and foods. Then I noticed men coming from a building with a container filled with beer. Aha! I thought this must be beer from the tap. So, I went close and saw that it was only a store to fill your own container and leave. Curiosity got the better of me, so I dragged Danuta into another door. There was a room filled with tables and chairs and just a few noisy beer drinkers. I lead Danuta to a table and then I tried to find a waitress to serve us. A customer came to my aid and flushed out the somewhat hefty waitress. I indicated I wanted a pitcher (1 liter) of beer, which she brought with two glasses. The cost 120 Rubles (12 cents). As we drank, we noticed that Danuta was the only woman customer in the place. When our glasses were about half empty, a man from another table came over and placed a pitcher of beer on the table next to Danuta, and left. We did not know what to make of it. Danuta told me not to accept it, one pitcher of beer was enough. It wasn't long before that same man, inebriated, came to our table, and sat on the chair next to Danuta. He began to come on to her, in a way that made Danuta a little nervous. I could see that the hefty waitress was standing nearby, her eyes glued to the intruder. Danuta finally turned to me and said that we should leave. We slowly got up, smiled at the man, said goodbye, waved at the waitress and left. Outside, Danuta appeared obviously upset over the event. I, too, was a little worried at the time that something might happen. After all, here was this older looking dude (me), with a very beautiful young woman, obviously my daughter, available for dating. So the man probably thought. Anyway, it was an experience that gave us something to talk about on our way to the bus stop. 1300: The buses arrived to take us back to the ship, again along the long dusty road.